Overweight and obesity lead to negative social and economic consequences for individuals, families and the national health system. According to the 2016 School Height and Weight Census, 34.6 per cent of the national school population is overweight. 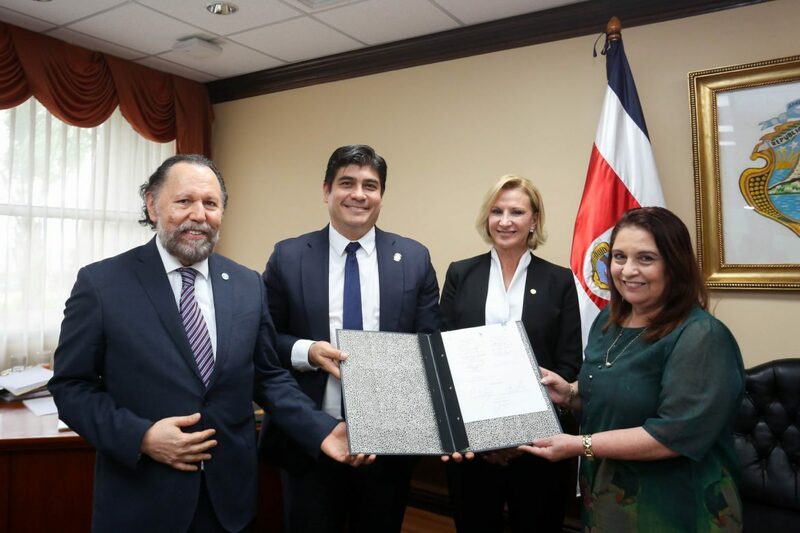 As part of World Food Day (WFD), the Government of the Republic announced implementation of a series of measures to promote healthy eating habits and combat the epidemic of overweight and obesity in Costa Rican society. This Tuesday, the “Letter of Commitment to comprehensively address overweight and obesity in the children and young people of Costa Rica” was signed in the Government Council by 10 ministers with witnesses of honour the President of the Republic, Carlos Alvarado Quesada, the FAO Coordinator for the Mesoamerican Subregion, Tito Díaz Muñoz, and the representative for Costa Rica of PAHO, María Dolores Pérez. “A balanced food intake that includes fruit, vegetables and fresh produce ensures that our boys, girls and young people have a better diet, as well as preventing a large number of diseases,” said Carlos Alvarado, President of the Republic. The 16-point charter includes a number of commitments to reverse the upward trend of overweight and obesity in children and young people and reduce the burden of non-communicable diseases associated with the unhealthy diets of this population group. In addition, the Government issued an Executive Decree declaring community and workplace interventions to be of public benefit. This is intended, among other objectives, to promote the work done by public institutions and communities to promote individual and group health through healthy eating supported by physical activity, mental health and freeing certain places from tobacco smoke. It also issued a Presidential Directive for employees of public institutions to work with occupational health managers to develop plans to gradually improve food services, be they in-house or provided by third parties, and to develop health-promotion strategies. These actions will be coordinated by the Ministry of Health through the category of “Environmental Blue Flag Programme Community Health. The Health Minister, Giselle Amador Muñoz, said that overweight and obesity lead to negative social and economic consequences for individuals, families and the national health system. According to the 2016 School Height and Weight Census, 34.6 per cent of the national school population is overweight. She added that the signing of these documents provided the conditions to enable public and private-sector health bodies to promote, organise and conduct coordinated projects in the areas laid down by the Ministry of Health. They also provided a framework for different population groups to access varied, balanced and healthy diets based on nutrition and quality standards. Work will also be done to promote implementation of education and nutrition practice based on current National Dietary Guidelines and appropriate healthy eating policies. To that end, the link between sustainable agricultural development and food systems will be strengthened, in order to increase the availability of nutritious, fresh, safe and affordable foodstuffs for the whole population. On this, the Minister of Agriculture and Livestock, Renato Alvarado Rivera, said, “With the collaboration of FAO, we shall support those traditional crops that are being underused, including fruit and vegetables among others, in order to increase the availability to the whole population of nutritious, safe and affordable food that supports better results in terms of nutrition, at the same time as being produced in a socially and environmentally responsible manner”. “We congratulate the Government of Costa Rica for including the issue of overweight and obesity within its public policy framework and for committing to a comprehensive approach that provides healthy and nutritious food to this important sector of the population to mark World Food Day,” said Tito Díaz, FAO Coordinator for the Mesoamerican Subregion. ¿En #CostaRica what is being done to tackle the increase in overweight and obesity?